A place for your good thoughts about those from your favourite motorsports that have put a smile on your face, inspired you, made you laugh or cry, made the sport a better place for you - doesn't matter about which branch of the sport... CART, F1, Indy, Sportscar racing, other formulas, karting, whatever you like. 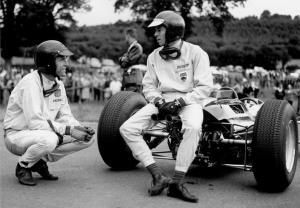 Dan Gurney and Jim Clark. Inspired me for some really simple reasons - both incredibly humble men and admired (possibly 'feared') each other for their ability, fiercely competitive. The only driver to win the F1 championship posthumously. Never really put my finger on why, but I was just in awe of this guy. His technique looked a little more ragged than most, but it worked for him in the wet or dry, it never changed - Bernie Ecclestone said at the time that he was easily a match for Jackie Stewart. Of course, some of these thoughts could have been through rose tinteds. Thank you for making this thread. I'll be the first to go non-F1, since I've only ever seen 30 or so grands prix in my lifetime! I'll go in chronological order, and that starts with the late 90s and Greg Moore. Moore...in his element, really. A great speedway racer, something he attributed to the ice racing he had done when he was younger (the cars, at least then, were very slippery on the big ovals, making it so much harder than it looks. 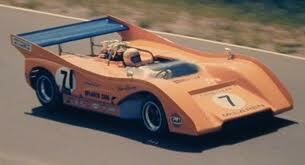 Moore initially struggled, so he was advised to spend his winter racing on ice. He did, and ended up as one of CART's greatest speedway racers). Beyond that, the bird...something Moore did a lot, only to play with photographers. 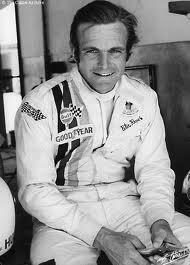 He and Montoya were good friends; actually, he and the entire paddock were good friends. He was a hard racer, brilliant car control, on McLaren-Mercedes' radar to replace D.C. for 2000 until he ultimately signed for Penske in CART, and an all-around great guy. He was always smiling, always having fun, and brought a great bond among the drivers. It was a hard hit for the community when he lost his life in 1999; Moore had only been in CART for four seasons, yet his 99 became the only number retired in the history of the sport. That's how big of an impact he made, most of it off the circuit. Then there's Alex Zanardi, the same era. It's a shame F1 never worked for him, because he was such a joy to watch in CART. His charge at the 1998 Long Beach Grand Prix, for me, was a bigger highlight than "the pass" at Laguna Seca in 1996, but then again, I wasn't watching live in 1996. My memory could be wrong, but I feel as though he was one lap down at some point during that race. Zanardi's story is told often, and I'm sure you all know what happened. I can't even put the moment of him running those last 13 laps at the Lausitzring into words when he did in 2003. Far cooler than any photo finish, any 2008 Brazilian Grand Prix, any of that. A great moment. And then a modern one. Shane Hmiel. He's not your typical "good man," not at all. Hmiel came to NASCAR in 2002 with a lot of promise. He had great talent and an aggressive style, but was pegged to be the next "bad boy" due to his scrappy attitude and tendency to get into it with other drivers. In 2003, Hmiel was suspended from NASCAR for testing positive for marijuana. He returned in 2004, winning his first race in the Truck division, and signed on as a development driver for Dale Earnhardt, Jr. for the 2005 year. After a solid start, Hmiel again failed a drug test, this time for both marijuana and cocaine, and was suspended indefinitely. During his process to return to the sport, Hmiel failed a third test, and was permanently banned from the sport. He hit rock bottom. His father, a longtime mechanic in NASCAR, stated Hmiel was refusing help, laying on the couch all day feeling sorry for himself, gaining weight, letting his life go. All talk about Hmiel died, and during that time, everything came together. Hmiel has bipolar disorder; he didn't know that until 2008. He "self-medicated" to deal with his condition after being misdiagnosed as a teenager and not knowing what was really going on. Since the diagnosis, Hmiel's life has made a complete 180. He's finally clean, and has returned to USAC, winning races across the country in open-wheel midgets. In a few weeks, he'll make his Indy Lights debut at Chicago. I believe in Shane. I believe he's truly past his worst days and into his best; now with an understanding of himself and taking action to handle his condition appropriately. I think he's a great story, I think he can raise a lot of awareness, and I don't think he's lost his talent. It's unfortunate he threw it all away, but its really nice he has a new chance in the open-wheel world, with sights set on the Indy 500. I hope he stays focused, keeps his life where it is now, and gets there. Even from the (generally) uneducated-to-Cart bunch over here, Greg Moore stood out as something special (I don't like using that phrase 'cos we all see what we like most times), but his achievements and the great story about the ice racing made him someone unique. Zanadri's tale is a strange one, from his career until F1 there seemed no reason why he wouldn't be awesome in F1, would love to know more about why it didn't work out for him - as for his life now, well, the guy is magic. Loved the story on Shane Hmiel, thanks Eric. Nice thread. Ok. You've got Jimmy there and I can't top the pic with him and the Tall Californian, so I'll go to the next down on my list. Gilles Villeneuve at Long Beach in 1981. My first F1 race and I saw it live with my Uncle. Being at Long Beach and watching Gilles in person was...well, it took a few years to fully appreciate what I saw. 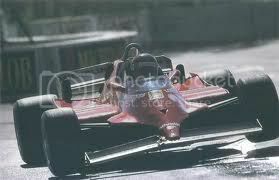 Many fans of Gilles never saw him actually race and that's a shame. Is it any wonder that I look at racing the way I do with Gilles as my teacher? EDIT: Upon further reflection, that GP had to have been '79 or '80 because I think I was 9 at the time. Ok, Gilles was on pole..what year was that? '79 I think....God I hate getting old. EDIT#2: Just looked it up on grandprix.com. Gilles was on pole and the field had to go 'round for one additional installation lap...so it was definitely 1979. So pretend the image is from '79. I need a beer. Mika Hakkinen. The pic here is at Spa in 2000. 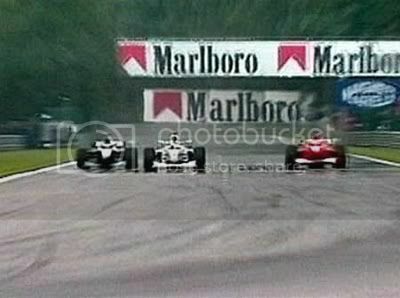 The infamous pass on Schumacher's Ferrari by splitting Ricardo Zonta. That sums up why I love Mika. No fear. Total commitment. Icy skill. David Coulthard was once asked (having seen the telemetry of both Mika and Kimi) which one was the most impressive. He said that Kimi never made him say 'Wow!'. He also out-qualified an on-form Senna in his first race. Mika sits as #3 on my all-time list behind Clark and Gilles. I miss Mika like I miss Calvin and Hobbes. 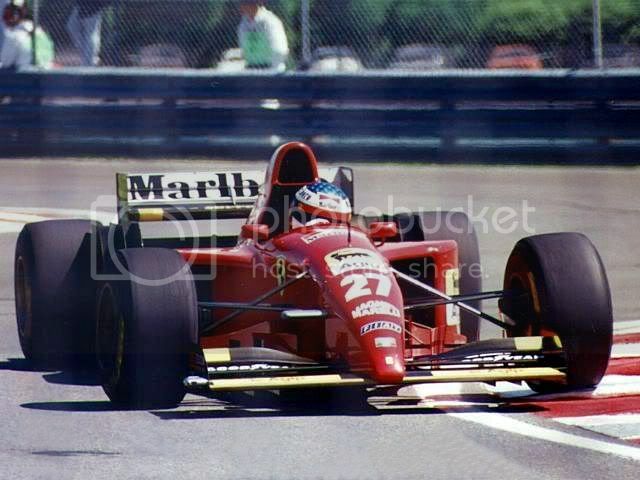 Jean Alesi, Montreal, 1995. I've always loved Jean's smooth yet aggressive style. Like Prost with attitude. I don't remember seeing this particular race live but then I was in my 20s and mostly drunk....so I don't remember much of that decade. A special race in every way. A Ferrari #27 wins in Canada under odd circumstances. The hand of Gilles reaching back from the grave to influence a race? I choose to think so. I'll end with a CART driver. Scott Goodyear. 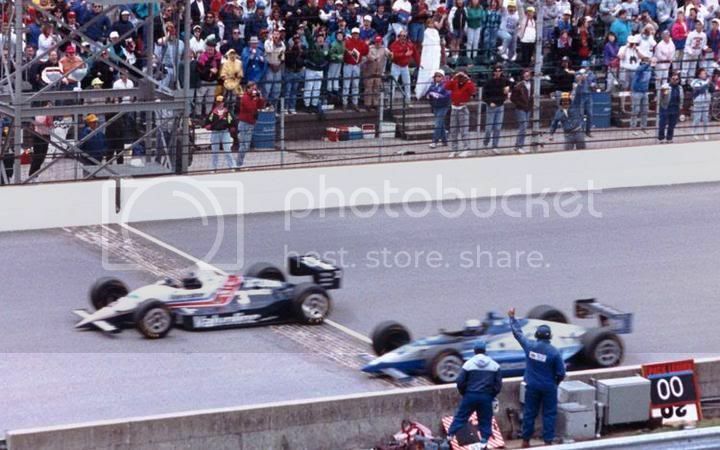 This pic is from the 1992 Indy 500 where he started dead last and finished 2nd behind Little Al by a fraction of a second. He was also a master of Long Beach. 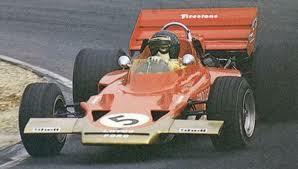 There were many drivers that CART has produced that could have done well in F1 but never quite made it to F1. Scott Goodyear tops that list. There are many, many more but I haven't the time to find and post them all. I'm sure the rest of you will post 'em....good drivers and moments are shared by many. note: I purposefully didn't include Lewis Hamilton or Fernando Alonso. Both of them continue to provide me with enjoyment every other weekend and I see no need to post any pics of them. American Football. You wouldn't know them. Afterwards, he spent the race raising his fist at Mass everytime he passed by. He was fined by the FIA for USD 2,000, plus $ 750 for returning to the pits in an unsafe way. Just imagine this same thing happening nowadays? Yes, they weren't all chivalrous back in the days. Of course, with time, being a nasty violent b#####d becomes "being truly passionate". In the end, he is remembered as one of the best racers there were. And he was. And he also was a nasty violent b#####d. Never let those colored glasses make you forget that great guys were also many times prima donnas in the past as much as nowadays. And just as we complain nowadays that overtaking is too difficult, in those years you would have complained that passing was too easy with a faster car, which meant that if it weren't for a lot less reliability (and guys like Jochen Mass) a guy in a faster car would end up lapping everybody. And people said that making overtaking more difficult would shift things from car's performance and make them rely heavier on driver's skills. We F1 spectators are a picky bunch and hard to keep content. On the other side, we all recall JPM as "that fat, nasty violent b#####d". He was also a hard fighter and one of the very few to defy Schumi on equal terms when Schumi has been sitting at top alone for too long. JPM was raw, crude but blazingly fast and with cojones to match his bulging figure. He also had a short fuse, but, just like Hunt, was capable of having a considerable amount of good humour (his pairing with Kimi seemd to be made by the director of "The Odd Couple" more than from a team manager). How can you not get the "oh dear" joke as soon as he said it? Silly grease monkey. Brilliant! And enjoy I did. I miss Juan P for everything you mention about him... a real character, brave, and damn quick. I, too, miss Monty. More than that, I lament the current attitude towards racing that leads great racers like Hunt and Monty to become more civilized. Nobody stops to think that their crude personalities go hand in hand with their raw speed and daring....if you put a cap on that, their racing will suffer. I miss the days when those violent b#####ds would be thought of as 'hard-edged racers' and 'ultimate competitors' rather than 'violent b#####ds'. There was a refreshing honesty in those days...you could genuinely love a gentleman driver as much as hate a b@stard (and make no mistake, for those that don't remember, people hated the b@stards back then). So when we're busy posting images and stories of these 'great men' take care to remember them as they honestly were. Racing drivers. A different breed from you and me. Closer to gladiators than we might like to admit. I, for one, honestly love 'em for it. We're living in a PC world. Please remove all your b################################## words so that the gentle ears of this generation do not get hurt. The upshot of this PC world is that to win is not the point, rather to be involved...heck in my lil ol' country, you can't fail at school these days...you get a "deferred pass"....say WHAT? Guess Massa was the deferred World Champ in 2008? Exactly the opposite of what I meant but...oh, well...George understood what I meant. A lot has been said about Mario Andretti, his accomplishments in the States and in F1 are remarkable, but one guy that's not mentioned too often really caught my imagination, Peter Revson. Peter is the last naturalised American to have won in F1, Mario not being born in the US. Funny, there was no, 'he won't make it 'cos he's from the USA' crap (but then there were no internety forums ), and it would have been wrong anyway.... he won one of the first British GP's I went to, Silverstone in '73 in a Yardley McLaren - he finished '73 with two wins and something like 8 or 9 top 5 positions, he was the real deal, great to watch and a match for any of his competitors. Most stories about him started with something like, "Son of the Revlon cosmetics family... drove(?) his own yacht... dated a Miss World... bla bla", when it should have started with his many achievements, such as his CanAm drives for Carl Haas (Lola) and Teddy Meyer (McLaren) with whom he won the CanAm championship, and CanAm cars were fire-spitting were beasts at the time. He finished 2nd at the Indy 500 too, not sure, but I think he put it on pole as well. After two years at McLaren it seems that the Marlboro fags sponsorship was too big to refuse, so Peter was dropped and went to drive for Shadow in 74, it was in practice for the South African GP that he crashed and lost his life, the accident was due to suspension failure. Another great talent was lost that day. Busy at work at the minute, but if anyone's got more info/stories/links to his career on his CanAm and Indy drives I'd appreciate it, ta. I understand the desire of non-Americans to want to take Andretti away from us, but really, Mario was born in Italy and came to America as a young child. He has always identified himself as an American. He raced as an American under the flag of the U.S. He is an American racing driver and an American F1 champion. Where he (or any other driver) was born is irrelevant. I know this wasn't your point, and I do appreciate the info on Revson, but it burns my arse when people make distinctions between 'naturalized' and 'native' Americans. If you're a citizen of the U.S., you're an American. Well tie me to a chair and duck me in the pond, I wrote that, then thought, someone is bound to jump on by back about leaving Mario out, so I added that sentence at the last minute! Come to think about it, in my wildest dreams I would never think of Mario being Italian. As for it burning your arse, look on the bright side Mike, the attitude in the US is that you're all American Citizens first and foremost (which, to be clear, is something I admire, and maybe slightly envious of! ), whilst we're still busy importing an immigration time-bomb. My appologies to you; I'm so sorry for my previous post. Thank you for having the grace to overlook my bad attitude in your fine thread! Thanks Mike, you're a gent, though no apology needed and no offence taken. Of those that like the sport now (aka, most people on forums), I wonder how many people on this forum have been to race meetings (in particular the big stuff, F1, Indy, F5000, CanAm etc) and felt the power, the the sounds, smell, and sight of drivers close up.... the whole experience of an F1 race used to blow me away, there's no other sporting spectacle that hits all of your senses quite the same - so is it any wonder that we become a little emotional about our sport? I don't mind saying, I do. I can remember hearing a Matra v12 and it blew me away, some friends that were with me burst into tears - the shock was amazing. So, to answer your question, I think there was a time (I mean an age when you first experience it, maybe a time when we're particularly sensitive to it) that it stays with you in a special way, and it does affect the way you think about the sport, and it does make us extremely passionate about it. Meh, I've had a beer, hope I made sense! Brilliant. I don't remember much from that first race except the sound. It was almost too loud but also deep; not painful, but exciting. I've heard the Minardi V10 2-seater roar around the streets of Las Vegas a few years back and that was painful to hear. Very loud and, despite all the technology involved, rather soulless. 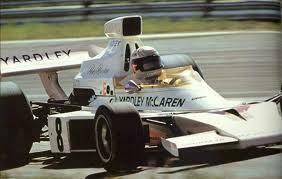 My love of F1 and racing can be traced directly back to the sound of those engines in '79*. If those cars of old were running silent electric motors it would have diminished the experience. *They all sounded different, too. That Low Tech was state of the art technology back then, more advanced for its time that anything we have today. Yeah, as DOF says, and Mike in the post above, all the sounds were different, all the engines were being constantly squeezed for every drop of performance. Though one glorious racing engine that's always stuck in my head as being low-tech-but-beautiful was the ones you've just mentioned - Chevy F5000 engines, a unique 'angry animal' sound that scared the sh1t out of small children We ran Peter Gethin and Brian Redman in a F5000 Chevron, and the sound of those monsters in the workshop was indescribable - used to reverberate through your body, the fecking building shook I am now slightly deaf, but boy, it was worth it.